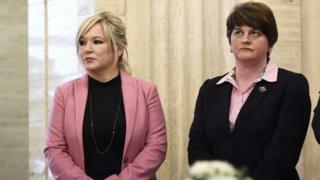 DUP leader Arlene Foster has said her comments in an interview with the Sunday Independent about Michelle O'Neill's blonde hair and appearance were meant as a compliment. Mrs Foster was criticised by Sinn Féin who claimed her remarks were sexist. However, she said her comments were intended to be positive. She told the BBC: "They were meant as a compliment. If they have been taken any other way, that is a matter for people who have taken them the other way." Asked if she regretted the remarks, or if they could be seen as sexist, the DUP leader repeated that they were meant to be a compliment. She said the response to them showed more "about Sinn Féin than it does about me". Following Mrs Foster's remark, Mrs O'Neill responded that there could be no place for sexism or any form of discrimination in public life. The DUP leader's "blonde" comment sparked a social media frenzy. Among those who reacted was Mrs O'Neill's teenage daughter who took to Twitter to defend her mother, calling Mrs Foster's comments "disgraceful". The row was labelled "#blondegate' on Twitter, as social media filled with memes.